Although Wake Forest’s campus isn’t exactly huge, the distance between Magnolia and South Campus feels really far when you’re in a rush and have short legs. As an upperclassman, I’ve been attempting to race to class without ending up covered in sweat. I thought to myself that this year would be different. So I got a bike. Mistake number one for a girl who learned to ride a bike when she was thirteen and then never got back on said bike again. I went to Wal-Mart and searched for a bike that screamed “I’m an eco-friendly animal lover who wears Chacos and bikes around campus.” Of course, because I’m only 4’9 (4’11 if anyone is asking), this was really difficult. The only bikes I could find for short people were bikes that came with pink and purple streamers and training wheels. And let’s not forget about the super cool bike with the unicorns on it. I tried out a ton of different bikes, but I couldn’t understand what was wrong with them. I felt like Goldilocks: “This seat is too high!” “These handlebars are too big!” “Why does this bike have gears?” After trying bikes for about an hour, I finally found my first set of wheels — did I mention I’m twenty and don’t have a driver’s license? I pick out this awesome seafoam green and silver cruiser. 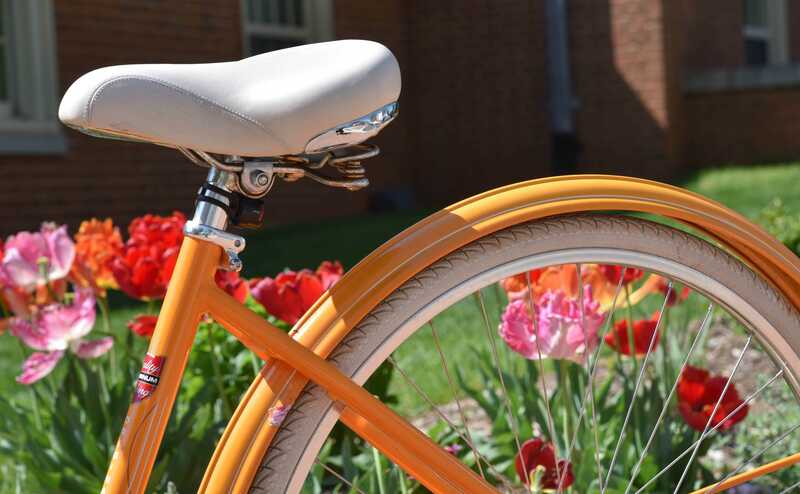 I add a cup holder for my coffee addiction and I’m thinking, “Yeah, I can totally ride this around campus.” I name my bike Regina, Reggie for short. We strap her to the roof of the car and she ends up on campus in one piece. It takes me a lot of courage to finally get on Reggie because I’m sure I’m going to make an absolute fool of myself. What twenty-year-old can barely ride a bike? I can only start on the right foot since I’m right handed, so I have to hobble around on the bike while I wait for the right pedal to come up. I push off and I’m riding! For a whole two seconds until I got to a hill and had to get off. I push the bike up the hill and coast down the road until a car comes up behind me. It is at this moment that I realize I have no clue what any of the bike signals are. The car comes up and rides slowly beside me as if they’re about to pass me. I was scared out of my mind, so I did the most logical thing I could think of. I turned right in front of the car and almost died. On the ride home, the same thing happened. I parked my bike and still haven’t gotten on it again. Legend has it, if you walk past Magnolia you can still see Reggie parked nicely on the bike rack, never to be touched again.